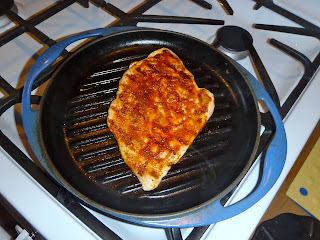 The big discovery of my Week 31 Dinner was an easy but versatile entree, smoked paprika chicken breasts. It was the perfect complement to the polenta-mushroom side dish that was the centerpiece of the meal. 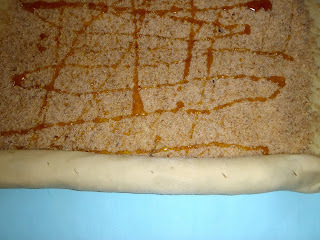 I discovered the recipe here, thanks to The Shiksa in the Kitchen :-), who is becoming one of my favorite food bloggers. She adapted it from someone else. It seems to be in wide circulation on the Internet. This approach to making chicken is simple, healthy, and elegant. Although it is not a traditional ethnic dish, the paprika flavor is very much in line with Slovenian sensibilities. I have made it twice, with slightly different seasonings. The original recipe calls for broiling. But we used our trusty Le Creuset stove top grill, which worked beautifully. It is probably even better grilled outdoors. I even had an "out of body" experience when I was pounding those boneless chicken breasts with the edge of a thick ceramic saucer. I was channelling my mom! I had forgotten about that old-fashioned technique. 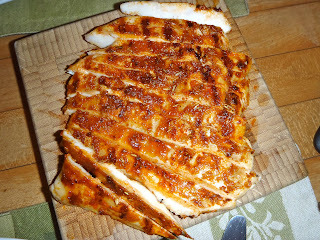 It really makes sense for grilling, when it helps to have the chicken in a thin, even piece. Place chicken breasts between 2 layers of plastic wrap. Pound with the side of a sturdy plate (or, if you have one, a meat mallet) to flatten into a thin, even layer. Mix the paprika, oil, and seasoned salt into a paste. Rub into both sides of chicken. Refrigerate for a half hour. Grill, turning when browned on one side. (Or use a broiler.) When done, remove to a platter. Let cool slightly. Slice into strips and serve. And here is the salad I put together. It's a rough outline, more than a recipe. But I suspect it will become another staple in my ethnic dinners, since it uses three Slovenian favorites: dandelion greens, pumpkin seed oil, and mushrooms. 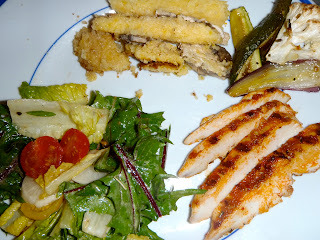 Mix ingredients for dressing, using proportions of oil and vinegar you prefer. Add sliced mushrooms and let marinate for at least ½ hour. Just before serving, add dandelion greens and toss.